Cowboy's Nightmare may be available for your next special event! 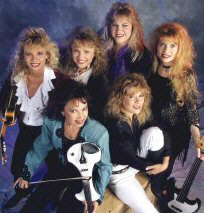 Cowboys Nightmare is the combination of six female musicians performing their own brand of renegade music. This band is a novelty not only in that the members are all women, but each is an accomplished musician. The musicians' command of several different instruments enables them to increase versatility of their repertoire as well as enhance the visual effects of the stage show. Cowboys Nightmare has hit in a big way. Since formation of the group in 1993, there has been high reaction from their audiences. From Santa Fe, to Katy, Texas, the fans flock in a variance of ages. These girls have worked hard to get the following they have and their hard work is paying off. They shared the stage with living legend Willie Nelson at The Fort Bend County Fair, presenting their original tunes. Cowboy's Nightmare clients include American Diabetes Foundation, Clute Mosquito Festival, Fort Bend County Fair, Houston Live Stock Show and Rodeo's Bar-B-Que Cook-Off, Katy Rice Festival, NASA Lake Go-Texan Committee, Needville Youth Fair, "Taste of Dallas" and more! The band also has a support staff, including merchandising, fan club, sound, lighting and staging production. booking entertainment, such as major name entertainers or celebrities, booking Cowboy's Nightmare, booking information on Cowboy's Nightmare, or hiring Cowboy's Nightmare for your special event, or to book or hire Cowboy's Nightmare, or if you are seeking the Cowboy's Nightmare booking agent for corporate entertainment or for a private party. Consider the opportunity to book Cowboy's Nightmare or other entertainers for a wedding, birthday, anniversary, business meeting or convention. If you are not a talent buyer, we are unable to provide Cowboy's Nightmare manager or management contact information. Consider this your official Cowboy's Nightmare booking agency web site – The booking agent who works for you! This company acts as an entertainment consultant or broker/producer and does not claim or represent itself as the exclusive agent, representative or management of Cowboy's Nightmare. Cowboy's Nightmare, country music artists - booking agent. This group may be available for your event. Book them if you can. You will have the time of your life!